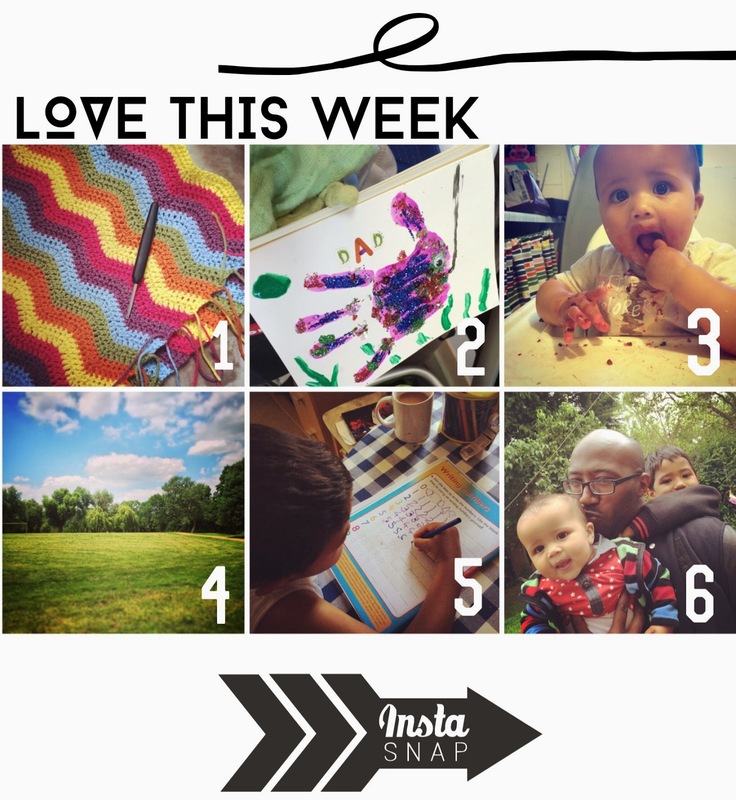 Some of my fave snaps from Instagram this past week. 1// I am by no means a crochet or knitting expert - in fact I am rather slow compared to others with these kinds of hobbies (as much as I love them!!) One of the mums on the school drop off asked if I would crochet her a blanket for her friends baby - of course I said. Not like I don't already have a million projects on the go. We worked together in picking the colours and went fr this rainbow bright yarn pack from The Homemakery and a lovely ripple pattern from attic 24. I am loving how this is coming together, the colours, the pattern and the stitches. Its so pretty. 2// We took part in a local craft hour at the Cafe in the park. The activity was to make fathers days cards. I was so surprised with M, he really enjoyed the session and was able to come up with his own ideas - for example he took it upon his self to add a lovely sparkly selection of glitter to his hand print fish. 3// My little N is such a good little eater (well not so much as the moment as we are the house of the plague!!) but this little trooper loves tasting exploring and eating. This week we have been enjoying some seasonal fruit - in this case blackberries. This little one LOVED them. Squishing them, smooshing them in his face and munching on them. He loved them so much that he took to licking the high chair tray for juice. 4// It has been some beautifully sunny warm days recently. We have taken to enjoying the weather by walks through one of the many parks we live so close to. Having a wander, taking our time and getting some fresh air. The beautiful colours of spring green against the sky blue and fluffy white clouds. 5// My big son has lots of energy. He is always on the go, and always has something else he would rather be doing. I have been trying to encourage his writing and mark making skills but quite often this is met with refusal. I had been getting the little one off for a nap and when I came out to the front room there he sat with his work book and pen tracing the letters. I was so proud. 6// My boys. they make me very happy and very proud. Very lucky all three of them are in my life. What did you love about your past week?